Sifnos is one of the Greek Islands located in the Aegean Sea 172 kilometres south east of the mainland port of Piraeus. The island is popular with Greek and international tourists alike and thousands of visitors flock here in high season. But the place hasn't been overwhelmed by mass-market tourism (yet) and you won't find the oppressive over-crowding which plagues the more popular party islands such as Mykonos and Santorini. You won't be able to appreciate the island's treasures as you arrive at the fairly uninspiring port of Kamares. Sifnos will strike you as a barren, rocky island with little to recommend it. You'll need to get to know its pretty villages, visit its ancient sites and roam its terraced hillsides, scented with wild thyme and oregano, before you can understand why this is the most visited island in the western Cyclades. There's no airport here so the only way to reach the island is by ferry or hydrofoil from the mainland or one of the neighbouring islands. There are daily ferries to and from Piraeus (five hours), Serifos and Kythnos. Regular services also connect the island with Kimolos, Folegandros, Sikinos and Santorini. Cut your journey in half and pay double for a Flying Dolphin trip from Piraeu , Kythnos, Serifos or Milos. Highlights of the island include its medieval Kastro village, perched on a clifftop on the east coast, its fine cuisine and the locally produced pottery which is exported throughout Greece. There are plenty of good beaches along the south east stretch of coastline and a lovely "untouristy" bay in the south west. An excellent local bus service and plentiful tracks meandering through the countryside will enable you to explore all the main sights without needing a car. You'll find an island peppered with elaborately decorated dovecotes, olive and almond groves, ancient monasteries and no less than 365 chapels (one for each day of the year). Sifnos was once the richest of all the Cycladic Islands , boasting huge reserves of gold, silver, aluminium and other precious metals. According to mythology the island takes its name from the son of the great Attican hero Sounios. But some historians believe the name comes from the Greek word for "empty" which is how the island was left after its inhabitants incurred the wrath of the god Apollo. Legend has it that the islanders sent an annual gift of a golden egg to the god's sanctuary at Delphi but one year they tried to get away with donating a gold-plated stone. Apollo retaliated by flooding the gold mines and leaving the island destitute. The island's charming capital Apollonia is named after the 7 th century BC Temple of Apollo which once overlooked the town. Online Travel guide with the best accommodation in Sifnos. Find the cheapest hotels is Sifnos & get exclusive online deals. Great rooms at bargain prices. Book online now! Compare Hotel Prices and read Reviews from others. Great Hotel rates and information See photos, reviews & what's nearby Sifnos . 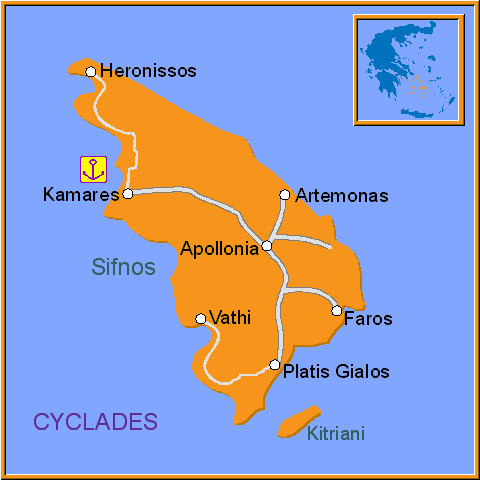 Detailed tourist and travel information about hotels of Sifnos providing also regional information.